The TMNT are attacked in their lair by a group of cyborgs lead by a female ninja named Pimiko. Donatello was severely wounded in the initial attack, and Pimiko ends up capturing Splinter while he was trying to help his fallen son. The villains escape with Donatello and Splinter as captives. 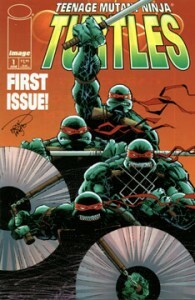 Raph, Leo and Mike chase their foes, but the villains escape in a helicopter. While the vehicle flies off, Donatello dreams of recent events and eventually awakes with a start – attacking the nearest cyborg! Both assailants crash out of the helicopter and begin freefalling to the ground far, far below. Back at the Turtles’ lair, the three remaining brothers investigate a fallen cyborg (that had its head removed in the battle). As Raph pokes the body with his sai, the head awakens and calls out a warning. Raphael ignores the warning and prods the body again, and this time it opens fire and the blast hits the curious Turtle in the face. Mike smashes the head and Leo cuts the body into pieces. Raphael’s face is severely injured and Mike leads him off to get the first aid kit. Master Splinter appears in astral form and informs Leonardo of the dire circumstances facing both Donatello and himself.